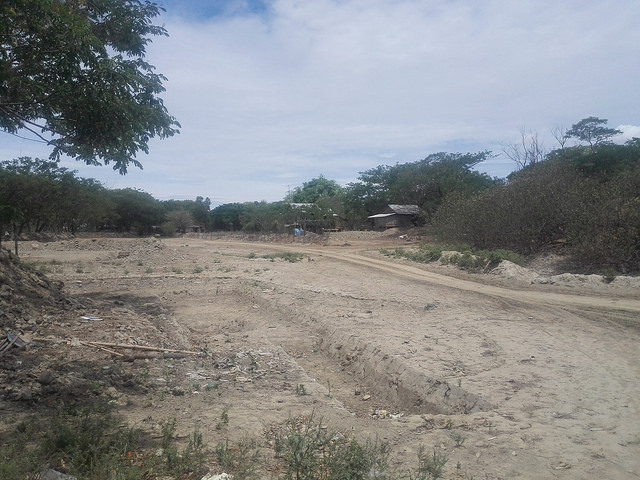 HTITA, May 22 2016 (IPS) - It has been two weeks now since the village of Htita, with its few bamboo houses hemmed in by parched, cracked earth and dried-out ponds, has enjoyed the novelty of its first ever water well. 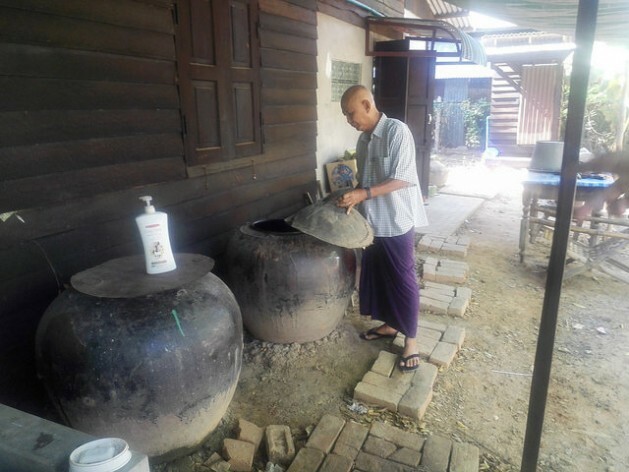 Young housewife Lei Lei Win walks to the noise of breaking soil to fill two yellow containers previously used for cooking oil. With the weight of the 20-litre ‘buckets’ balanced on a pole on her shoulder, it now takes her only one minute to provide her family with the water that she will need to get washed, cook, and also drink. She usually makes two trips a day. The nearly 200-metre-deep well is not the result of government planning, but the combined 3,000-dollar donation by a Yangon businessman who hails from the village and a travel agency named Khiri, run by a Dutchman, which donates part of its income to build wells in the driest parts of the country. Situated in the internal region of Bago, Htita is only a two-hour drive from Myanmar’s biggest city, Yangon. Even closer is the village of Kawa. 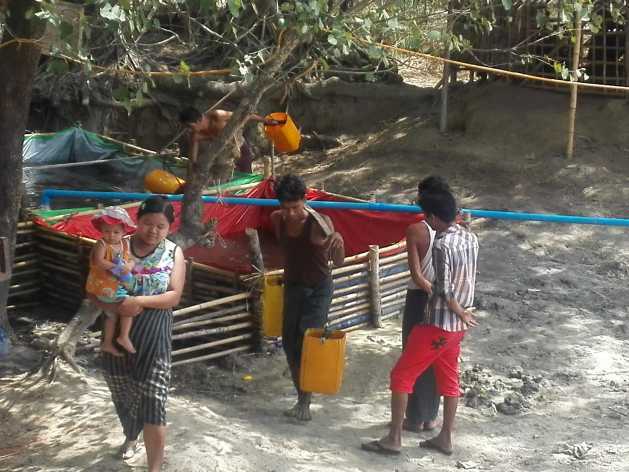 But even if residents are enjoying better living conditions, only a few here can afford to pay some 30 dollars a month – a considerable amount of money in Myanmar – to pump water from a nearby underground water source directly to the house tank. According to a 2014 census, a third of households in the country of 51.5 million people uses water from “unimproved” water sources. A quarter of the population has no flush toilet. Only an average 32.4 percent of households use electricity for lighting. The same census found that life expectancy in Myanmar is among the lowest in the ASEAN region. Much of this is due to lack of water and food security, with water scarcity and excess of rainfall playing an equal role. “Water is abundant and plentiful in Myanmar, but there is little infrastructure and electricity, so the economics of accessing water are problematic. This is why the shortages continue year after year,” says Andrew Kirkwood, fund manager of the Livelihoods and Food Security Trust Fund (LIFT), a multi-donor fund that focuses on the rural poor in Myanmar. About 90 percent of rain in Myanmar falls during the rainy season, from June to October. But geographical differences are enormous: rainfall ranges from 750 mm per year in the most arid region of the country to 1,500 mm in the eastern and western mountains and 4,000 to 5,000 mm in the coastal regions. Shortages in the dry zone have been more acute this year because the scant rains of the year before resulted in limited water-storage, according to LIFT. On top of this, El Nino’s higher temperatures during the following 2016 hot season triggered higher evaporation rates. However, in other areas of the country, failure in ensuring water security has historically been caused by the opposite: extreme rain and disastrous floods. With the deadly 2008 cyclone Nargis still engraved in the country’s memory, during the rainy season of 2015 the country had to face another emergency. Vast areas, from states in the North-West to the Delta region, were hit by severe and prolonged rains. With no proper water control measures in place, the outcome of an otherwise-manageable natural phenomenon was disastrous: dozens of deaths and almost two million acres of rice fields either destroyed or damaged, according to UN’s humanitarian disaster agency OCHA. In both cases – drought and floods – failures in managing water security bring precarious hygiene conditions and illnesses, while the effects on agriculture reflect in high malnutrition rates. In the Dry Zone, 18 percent of the population suffers from malnutrition, according to a 2013 LIFT survey, while a staggering quarter of children under the age of five are underweight. The correct administration of water resources is the root of the problem in Myanmar, according to NGOs and institutional actors. UN data shows that only about five percent of the country’s potential water resources are being utilised, mostly by the agricultural sector. At the same time, growing urbanisation and the integration of Myanmar into the global economy after five decades of military dictatorship are enhancing demand. The new government of the de facto leader Aung San Suu Kyi is therefore faced with the major challenge of delivering solutions to support the ongoing economic growth. Even against the odds of scant resources, farmers in the Dry Zone produce most of Myanmar’s sesame and pulses, making it one of the largest exporters in the world. The economic impact of better exploitation of resources is evident. However, says Kirkwood, investments have been so far misplaced – forcing farmers, for example, into rice cultivation – and policies inefficient, such as not collecting sufficient fees for water. 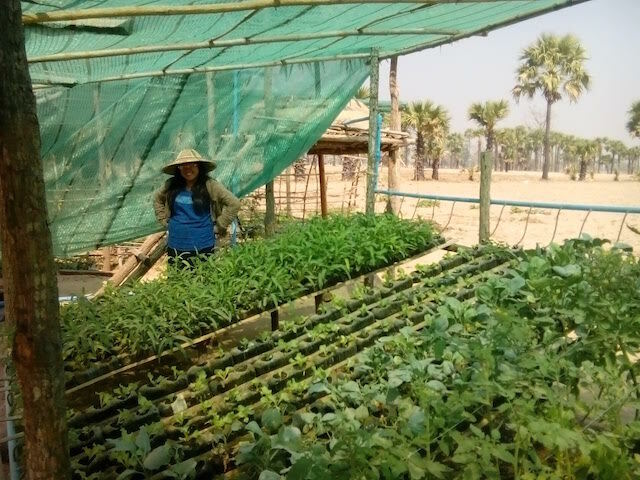 Terre des Hommes, an NGO, has successfully introduced into the Dry Zone a hydroponic farming system developed by the University of Bologna. The system requires 80-90 percent less water than soil-based farming, while recycling fluids enriched with fertilizers. It allows landless farmers in particular access to fresher and cheaper food. “The project has involved 45 villages in townships across Mandalay and Magway,” says project manager Enrico Marulli. The latter region has the highest under-five mortality rate in the entire country, more than twice the rate of its biggest city, Yangon, reflecting the urgent need for life-improvement solutions. But the long-term sustainability of these project finds its limits in the overall restructuring that the country has to endure. With a new greenhouse costing between 70 and 80 dollars, without external donors’ contribution only access to credit can support vital technological improvements. However, farmers’ financial inclusion is virtually inexistent. In contrast to other developing countries, microfinance in Myanmar goes mainly to the agricultural sector, says LIFT, but only bigger financial institutions have the capacity to sustain longer-term, higher investments. Al of these issues will come to the fore on May 24, when the Global Water Partnership High Level Roundtable on Water Security and the SDGs will be held in Yangon. The meeting aims to accelerate gains made by ongoing projects related to water and sanitation, under the guidance of the government of Myanmar and the World Bank. Meanwhile, in the village of Htita, villagers continue to enjoy the revolution of the new well and fill their yellow containers. find substitute to firewood.use of wood fire cause deforestation and causing those problems and one more allowing Teak plantation to privatize esp those closer to dry zone. Even driest zone of Myanmar has average 40 inches of ranin per year, which is more than enough.